I have just updated this applet to display contrail grids by default. There are just two flight paths that intersect, and the grid forms as the contrails from those two paths are blown by the wind. To get the racetrack simulator, uncheck the “intersection” checkbox in the lower left. I think one more simulation of two contrails intersecting above a VOR with a wind blowing would finally allow people to grasp the “mystery” of grids. Indeed. That’s my next step. Also, it would be nice to have pause/resume button. Wonderful work. I can’t get over how impressed I am! I’m hoping you’ll do the same thing with the grid patterns soon. Maybe you could make a 3D applet which would allow you to explain how pockets/layers of differing air conditions can exist inside a much larger area of other conditions. With shading and color you could REALLY improve the 3D perception that so many DON’T have of their atmosphere. Could you also simulate how a single persistent contrail could be viewed by millions of people at the same time. Using simulations of perspective like this may clear a lot of things up for other researchers and observers of “chemtrails”. Mick, You rock for the effort you put into your site. If it saves just a few people from living a life filled with fear of harmless water in the sky it is hopefully worth it and you’ve helped prevent the needless spread of anxiety and misery. Hope you have some fun and satisfaction doing it. It’s perhaps rather fortuitous the L.A. “missile” event happened as it probably made a greater number of sane people aware of this absurd conspiracy theory. Quite some work has been done since I have been gone. Impressive. Because of the size of the track it’s more likely an in-flight refueling tanker. Not sure that this is the right place for my comment, as it is not about simulations but time lapse videos. Still there are lot of analogies to draw. The video makes apparent a high altitude of the contrail against the passing layer of low clouds. Each of them compresses from one and half to two hours into 10-second HD video. In No. 64, there is a crossing of two contrails; in No. 79, a horizontal contrail is drifting from behind the horizon toward the camera. No. 34 ends with 22° halo around the sun, allowing the estimates of angular sizes of the viewing area on these time lapse videos: width – about 66°, hight – about 49° (or 45°, taking only the sky area). I wish that “skywatchers” put some effort into making time lapse videos of contrail grids, unusual patterns etc., showing their formation and evolution, instead of static images zooming to or cropping small areas of sky, usually near the horizon, where the density of contrails appears the highest. That’s a really cool picture, J. Notice how the persistent contrails are only visible in the area showing clouds. Mick, I wonder if everyone is aware of the portable phone application called planefinder http://my.pinkfroot.com/page/plane-finder-1 That allows you to point your iphone or windows phone at a plane you see in the sky and it will identify the plane, its airline, destination etc. It would be nice to see contrail disappearing over time. It would be nice to have “refresh” button that would remove old contrail and start a new one after changing the orbit parameters. Wow, this is absolutely STIRLING work. I’m not huge with computing, so I had no idea a handy little ‘applet’ like this was even possible. If my arms were longer, I’d pat you on the back! Well done. One of the most commonly cited conspiracy theory “mysteries” of “grids” is simply the result of basic geometry and wind. Sorry for being offtopic, but i´ve forgotten my password (and!) Username I´ve used sometimes ago in your forum. A short summary: This Chemtrail-proof-video used Public-Relation-Videos from Airbus/EADS for their tanker A330-200-MRTT / A310-MRTT aka KC-30 and shows the installation of some machines that seems to spray something. But the Video didn´t mention wich Aircraft this is, for whom it is construted and that it is just an Fuel-Tanker to refuel other Aircrafts. Another Video on this blog debunkes an Leuren Moret Interview for exopolitics. They say, that the Space-Shuttle had made secret spraying actions in our atmosphere. But they weren´t secret. There were not real “Actions” becorse the Shuttle just thrusted the Reaction-Control-Trusters in normal Orbit above 200 kilometers – as the shuttle did it in every mission thousand times before. This “secret Experiment” is public on the NASA Homepage, it´s called “Simplex”. The experiment had the only reason to get knowledge, if some other unknown Rockets/Ships/Satellits would use the Reaction-Control-Thrusters above a Radio- or Radar-Telescope, could this Teleskope detect this action? I’ve not visited this site for some time, but I’ve been linking to it or telling folk to come here every time the ‘chemtrail’ lunacy rears its head. You’re doing some really great work here, and it’s much appreciated. I encounter more conspiracy-inclined people than ‘normal’ folk might encounter, and I find this site to be an excellent resource. Two of my nephews have raised their fear of chemtrails. They’re intelligent, if suspicious, lads. Both have spent weeks going through the threads, and both are satisfied that the chemtrail menace can be ignored. This allows them to focus on stuff that matters, like turning third level education into debt slavery (my own bête noire). Now, if only someone would sort out the moon landings hoax with a debunking site as fine as this! Thanks, just what I was looking for! I have some contrails left by Sun grazing comets in the solar atmosphere, which are extremely interesting, from the SDO mission. Would you mind posting a stand alone version that could be used in a powerpoint presentation? I guess what gets downloaded now is missing a required class file. Here’s the full source for the Processing version , which also includes the exported version I upload, and should have all the files. You were probably missing the processing-1.0.0.js file. Sorry this is absurd as you can simply watch/record the same plane fly back and fourth and follow from horizon to horizon, flying directly overhead. Very small local airprt with only 4 larger aircrafts coming/going per day. A look @ FAA maps show little other air traffic in my area. Many patterns are also layered with the same plane flying back and fourth @ increasing altitude. A continuous upward stacking ribbon. Few or no breaks and these planes are not far off nor high altitude. I see a recent change however, to a higher altitude~lower close in=flooding and cold weather. Higher altitude=drought and 50 degree’s in dec, whereas 50 below zero would not be unheard of. The latter temp and precipitation is via observation of two things, occuring @ the same time. Which could, of course, be total coincidence with no connection. Much of the flight traffic overhead does not go to local airports, but to larger ones. 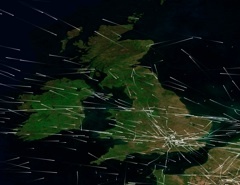 Find out whether you live near regular flight paths. For example, use flightaware, planefinder, etc. Me, for example, I live near a very small local airport with hardly, if any, commercial traffic at all. Nevertheless, we lots of planes crossing and, if the weather is right (especially autumns), persisting contrails. Why is that so? Because I live some 200km west of Berlin. Much of the traffic going to London, Amsterdam, maybe Paris and Frankfurt, is visible here (there is a post on visibility on this site, check it out). So it’s not the local airport I look for to explain the traffic. The planes overhead are too high to have started there.